Looking for a lighthearted spoof to show your tweens and teens? Team Teenettes is a film that doesn't take itself too seriously. It is more of a comedy than anything else. 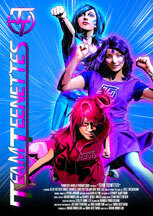 The storyline follows the Teenettes, a trio of female super heroes who are called to action anytime their city is in danger. The film feels like an homage and a mockery of shows such as Powerpuff Girls and Power Rangers. When one of the main characters questions the team's actions, she is told to "just go along with it." There is also a fourth wall break, which is shat makes it seem so bad, it's good. It has a type of situation similar to The Room. I actually enjoyed the hokey acting and the sub-par visual effects. Even the villain, "The Evil Doctor" has the most ridiculous reason as to why he wants to destroy the city. I couldn't help but laugh at the premise as well as the scenes when the Evil Doctor and his assistant interact with each other. The background music reminds me of the "Bulk and Skull" theme from Power Rangers. That song only plays when the characters Bulk and Skull are on screen and are messing something up or acting dumb. The most unappealing aspect of this film is the acting, which is pretty amateurish. However, I still think that younger kids would enjoy it, especially the special effects. The scenes jump around a bit as the plot develops and the beginning is a bit jarring because you are thrown into an action scene without any introduction to the characters or the plot. It has some vocabulary that might go over the youth audience's heads. On the other hand, the cinematography and audio is very good. The sets are appropriate and the costumes work. If you are looking for something campy and fun, then this will suit the bill. IT doesn't take itself too seriously and your audience won't either. I give this film 3.5 out of 5 stars and recommend it for ages 6 to 13. Reviewed by Angel U. and Julie S., KIDS FIRST! Adult Jurors. Balancing regular battles against a giant robot and a mad scientist with high school life leaves supercharged teen hero Kaylee questioning the predictability of her team's missions. From Canada.